Ø2.4x175mm cerium tungsten electrode price is 0.985USD/PC on Mar. 21, 2019, EXW, Xiamen, China. The advantages of WC20 electrode are good arcing performace and less arc current. 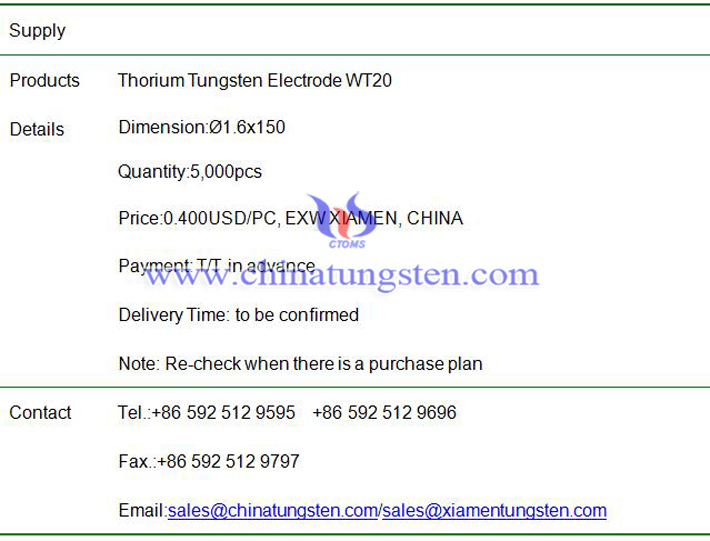 Ø1.6x150mm thorium tungsten electrode price is 0.400USD/PC on Jan. 30, 2019, EXW, Xiamen, China. 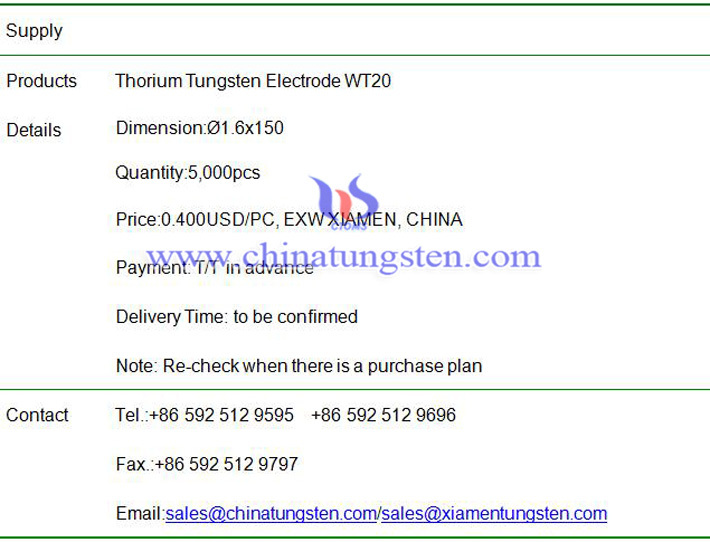 The weldability of thorium tungsten is much better than pure tungsten electrode, and it is widely used in DC current. Ø1.6x150mm thorium tungsten electrode price is 0.400USD/PC on Nov. 20, 2018, EXW, Xiamen, China. The grade code for thorium electrode type is WT20, which is with 0.2% ThO2. It is widely used in arc welding. Ø6.0x150mm cerium tungsten electrode price is 6.20USD/PC on Oct. 31, 2018, EXW, Xiamen, China. 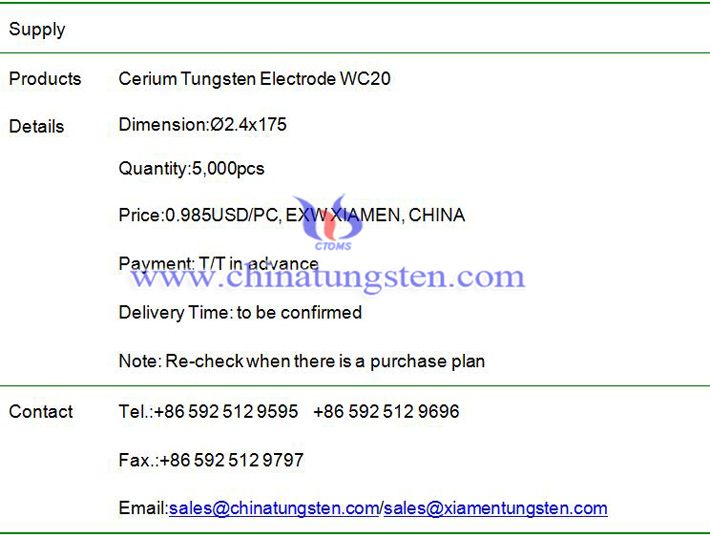 The grade code for cerium electrode type is WC20, which is with 0.2% CeO2. It is widely used in arc welding. Ø6.0x150mm pure tungsten electrode price is 6.20USD/PC on Oct. 18, 2018, EXW, Xiamen, China. Along with a stable market, the price of tungsten electrodes keeps the same as last month. 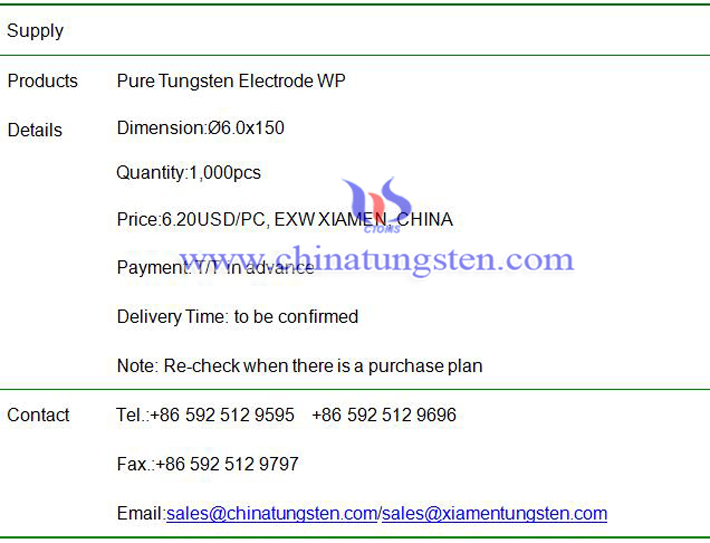 Ø6.0x150mm pure tungsten electrode price is 6.20 USD/PC on Sep. 12, 2018, EXW, Xiamen, China. Still because of the environmental protection policy affects the price of tungsten raw materials, the price has been kept stable after a short decrease. But the exchange rate is in a very good condition for exporting now. 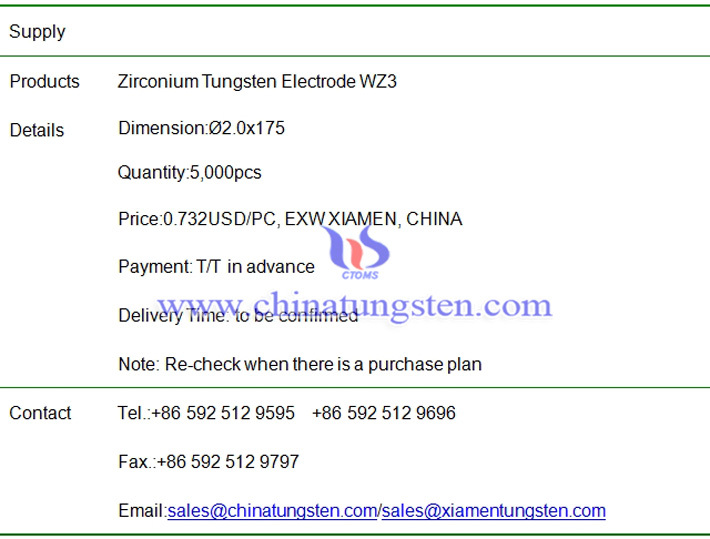 Zirconium Tungsten electrode price is 0.732USD/PC on Aug. 10, 2018, EXW, Xiamen, China. Tungsten raw material has been showing a decrease trend these two weeks, also the exchange rate has provided better situation for exporting. Therefore, the price has been going down. 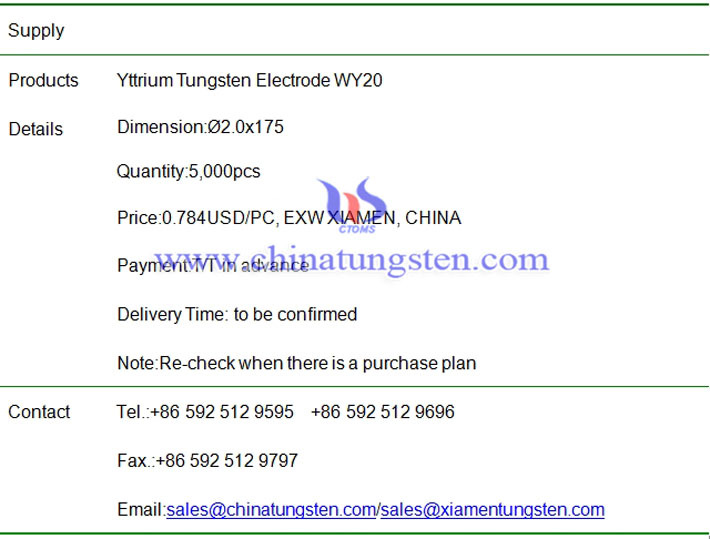 Yttrium Tungsten electrode price is 0.783USD/PC on Jun. 29, 2018, EXW, Xiamen, China. Regularly they are added with 1.80%~2.2% YO2 and its grade is WY20. It can be recognized by the end color of blue. This kind of electrode is mainly applied in military and aviation industry. 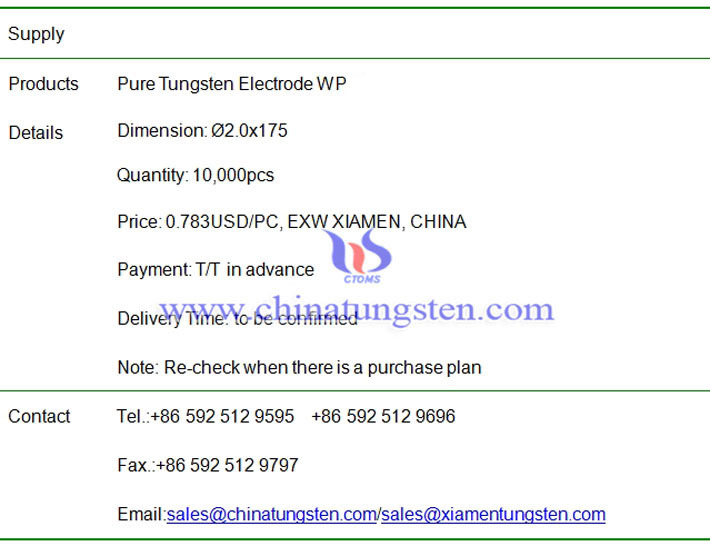 Pure tungsten electrode price is 0.783USD/PC on May 4, 2018, EXW, Xiamen, China. 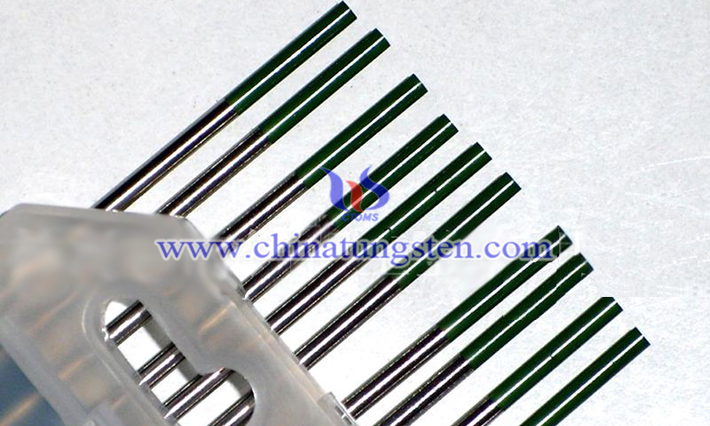 The grade for this electrode is WP and its tip color is green. Even though the price of tungsten finished parts are hysteresis compared with the going up raw material, now they are showing their increasing trend. 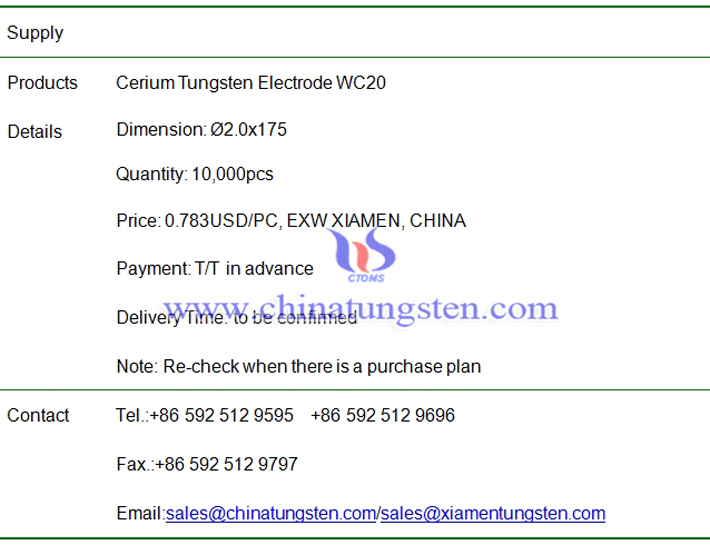 Cerium tungsten electrode price is 0.783USD/PC on Apr. 27, 2018, EXW, Xiamen, China. 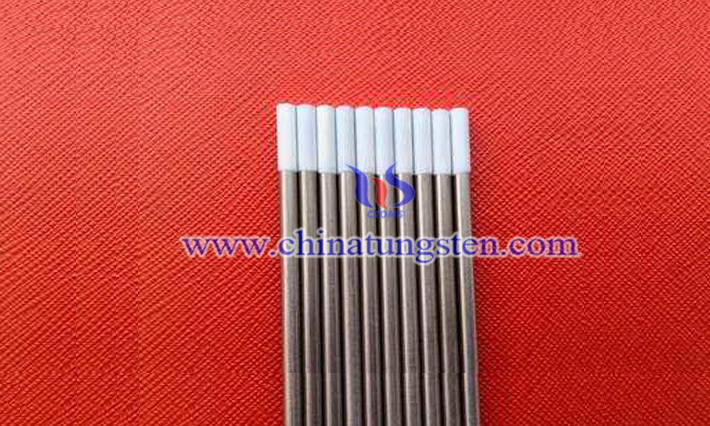 The grade for ceriated tungsten electrode is WC20 and its tip color is grey. Even though the price of tungsten finished parts are hysteresis compared with the going up raw material, now they are showing their increasing trend.